This picture shows the lab in detail. 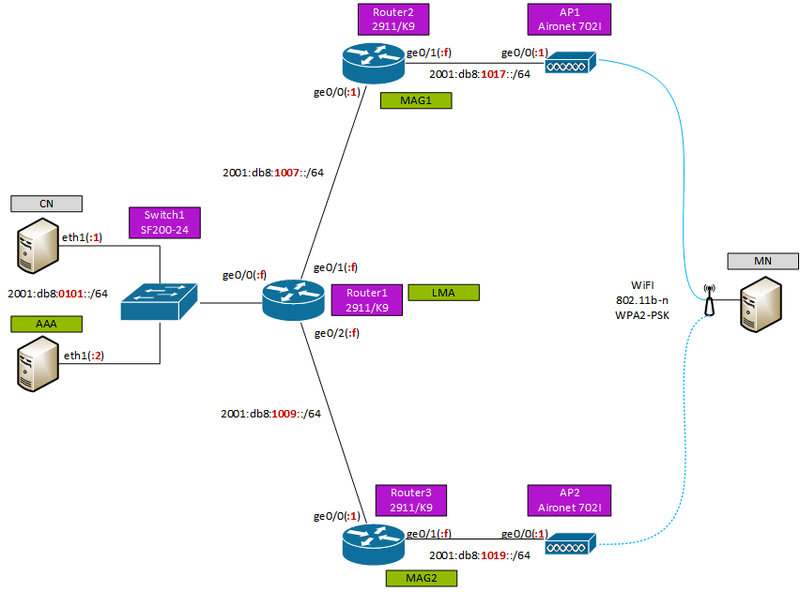 3 Cisco 2911/K9 ISR routers acting als MAG and LMA running IOS 15.6, two Aironet 702I wireless access points (IOS 15.2(4)JB3a) and 3 hosts running Ubuntu 16.04 LTS acting as CN, MN and AAA (FreeRadius). 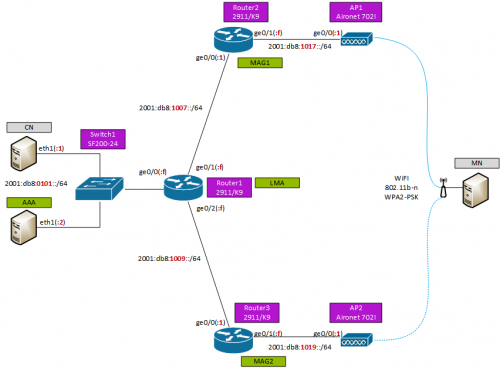 MN associates with AP2 using pre shared key WPA2-PSK. AP2 is configured to act as wireless bridge. 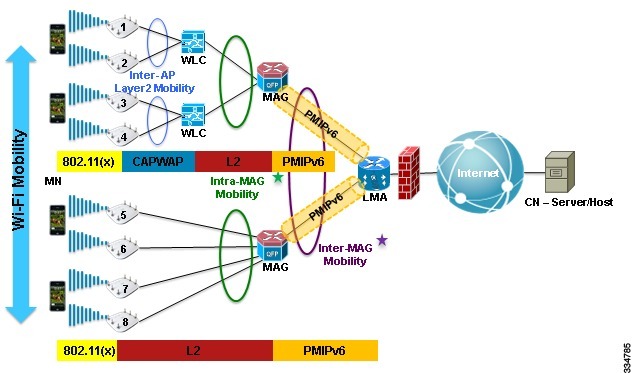 After MN successfully associates with AP2 its wlan0 interface comes up and Linux IPv6 stack sends a Router Solicitation (RS) which is recognized by MAG2 as a PMIPv6 attachment trigger. MAG2 is configured to send a Radius access-request to the AAA server to provision MN properties like home prefix etc. All values in this request are OK except the “User-Name” attribute is missing which should contain the MAC address of the MN. Instead the MAC address is placed in the “Calling-Station-Id” attribute. FreeRadius answers this Access-Request with a Access-Reject message as it cannot find the User-Name attribute. The big question now is: How can MAG2 be configured to send MNID in User-Name attribute? If anyone has an info, answer or hint - just leave a comment. Note: For the lab to work anyway a NAI for the MN was locally configured in MAG2. So after the negative AAA Radius request MAG2 tries to locally handle the connecting MN which succeeds and MAG2 sends its binding update to LMA and receives binding acknowledge. See console logs at the end of this post.
! the default NAI are copied over at first connection from this MN.
! After this the running config is altered to contain default NAI's attributes.